Reporting Live from a Hurricane: Just Stop! 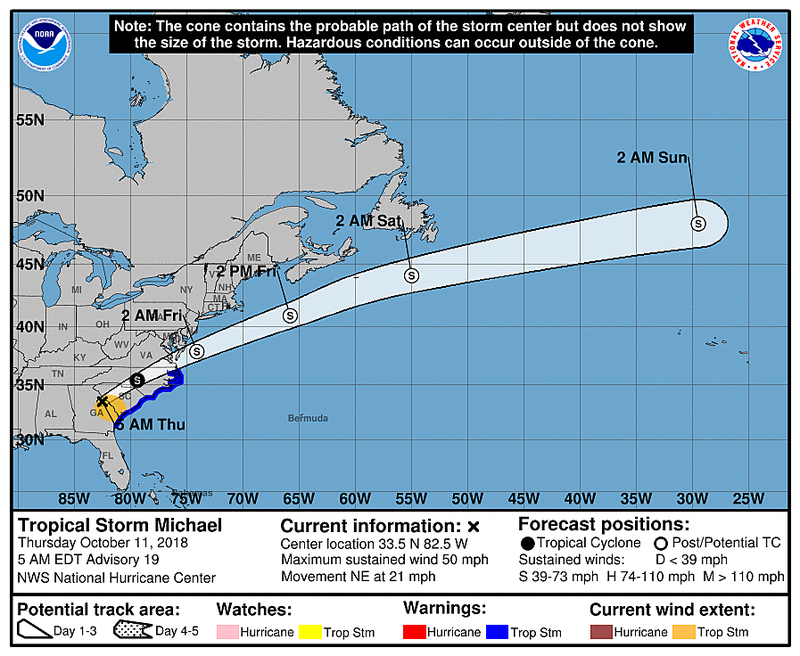 As of this writing (6 a.m. Thursday), Michael has weakened to a tropical storm, with maximum sustained winds of 50 mph. The storm is centered over the Georgia-South Carolina state line, and will shove toward North Carolina and Virginia as Thursday pushes on. 1.) Rain and Wind Part 1... Scattered showers will arrive from the southwest Thursday morning, with periods of rain through Thursday afternoon. This precursor event could feature some pockets of heavy rain. And it will be breezy during the daytime hours, with gusts to 25 mph (no more than that). 2.) Rain and Wind Part 2... The steadiest, heaviest rain and gustiest winds will arrive Thursday night through early Friday morning. Rainfall rates of 1 to 2 inches per hour could make driving very difficult, both due to flooding/ponding issues and near-zero visibility. Wind gusts are forecast to peak near 40 mph across inland New Jersey and near 50 mph at the beaches. That's strong enough to bring down sizable tree branches and cause power outages. 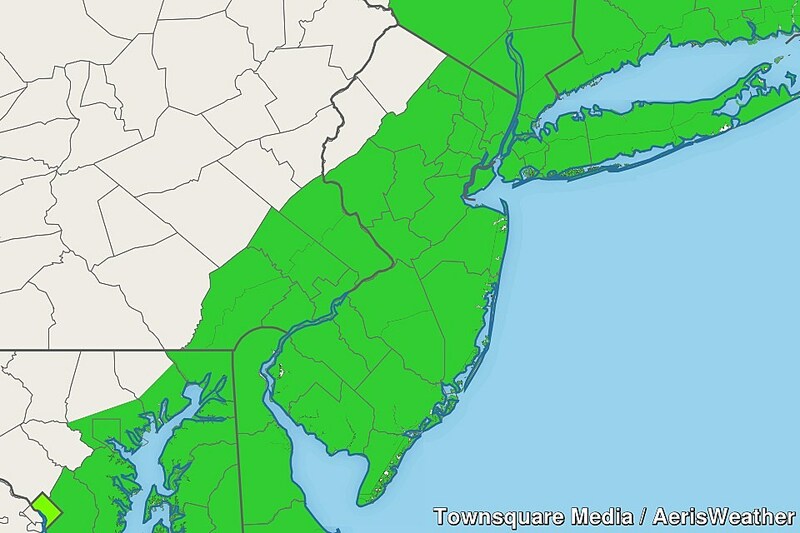 A Flash Flood Watch has been issued for 19 of NJ's 21 counties, from midday Thursday through early Friday morning. 4.) 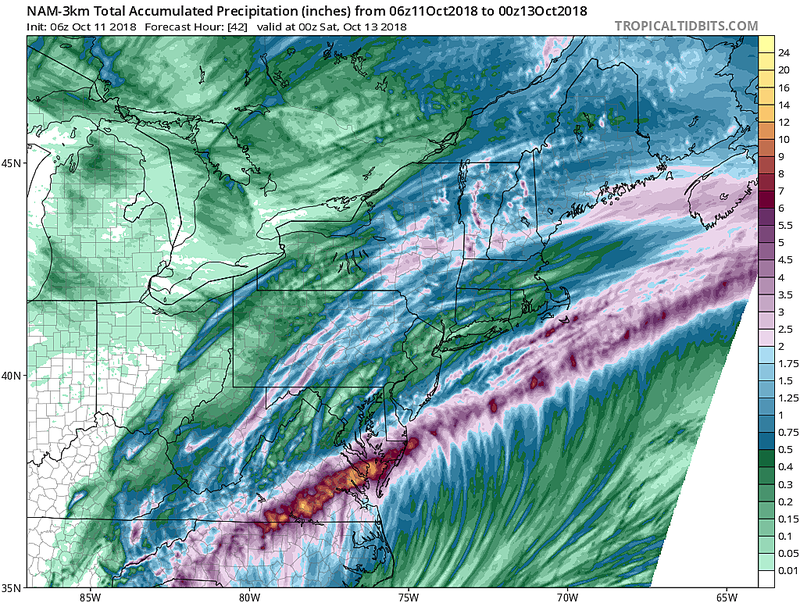 Rainfall Totals... NW NJ (Sussex and Warren counties) will see the calmest winds and lightest rain, with totals maybe in the half-inch to inch range. (And even that might be pushing it.) Most of the state should expect 1 to 2 inches of rain. The worst of it will affect the south coast, around southern Ocean, Atlantic, and Cape May counties. 3+ inches of rain could cause significant flooding. 5.) Down the Shore... In terms of coastal issues, the Jersey Shore has little to worry about from Michael. Surge estimates are below a foot from Sandy Hook to Cape May. 6.) Action Steps... As long as you don't dip into complacency and stay "weather aware" over the next 24 hours, you'll probably weather Michael's storm OK. Consciously stay alert to changing weather and road conditions, and avoid unnecessary travel. 7.) Clearing Out... Rain will come to an end by about 8 a.m. Friday, as Michael (like a post-tropical storm at that point) rapidly pulls away from the U.S. East Coast. Winds will calm significantly and skies should clear to sunshine by Noon Friday. 8.) Cooling Down... And then, here comes the big cooldown! Temperatures will tumble throughout Friday — 60s in the morning, 50s in the afternoon, and 40s at night. 9.) The Weekend... Yup, it is definitely going to feel like fall! Morning low temps will probably end up in the 40s for the majority of the Garden State. There could be a few 30s in NW NJ and the Pine Barrens (especially Sunday AM) — that could be cold enough to produce our first frost of the season. Afternoon high temperatures will be in the lower 60s, at best. Models have stubbornly painted a shower and/or some drizzle over New Jersey Saturday morning, but I don't completely buy it. (Our atmosphere is going to be very dry.) Other than that, we'll see a mix of sun and clouds throughout the weekend.